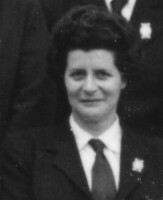 IN CARE at St Leonards NCH (1959 -1962). The form that says it all !…..Well interestingly enough it doesn’t actually say my name! 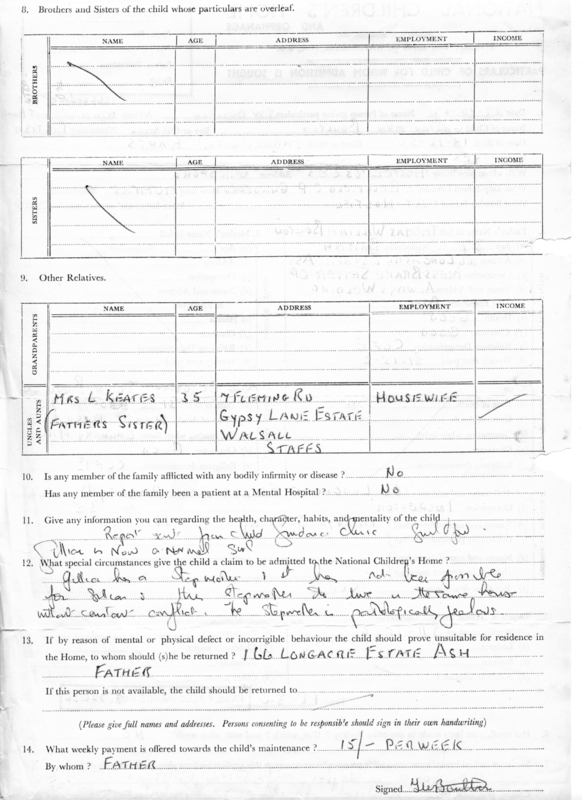 It has a blank where my name should be…..Very strange how that was overlooked, anyway it was me that went into care! Signed, sealed and delivered, one little girl…….. I WENT UNDER THE WING OF THE NATIONAL CHILDREN’S HOME ON 3rd NOVEMBER 1959. I was 8 years old. 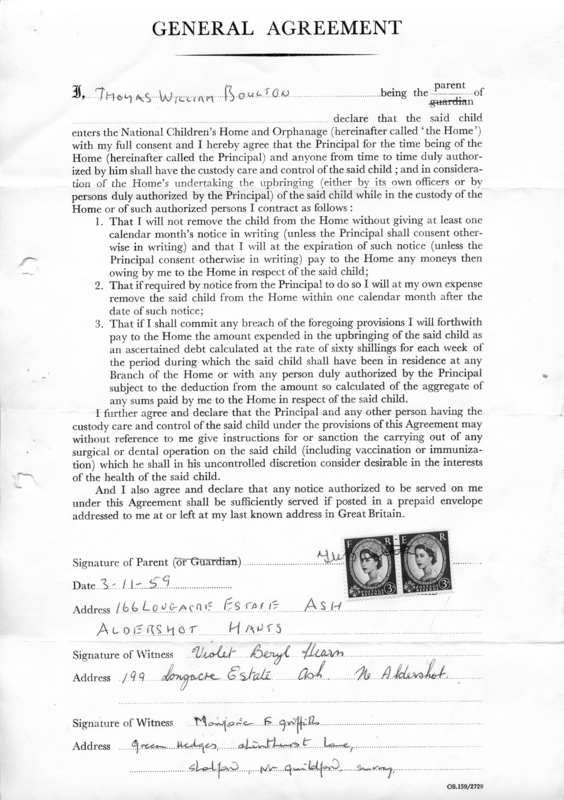 “What special circumstances give the child a claim to be admitted to the National Children’s Home? 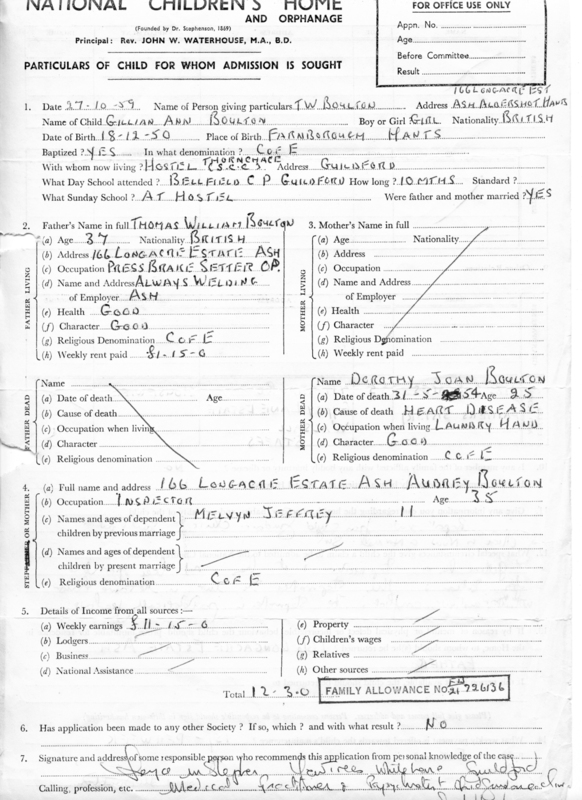 *Note that on the form where it says ‘GRANDPARENTS’ my father left this blank, denying both my grandparents and me to any contact……This is the thing l find the hardest to understand and forgive him for, why did he take everything from me? And so it was that l went into care……l lost all my dead mother’s family who were ever bit as attached to me as l was to them……l hadn’t one single photograph of any of them, or any of myself….They had disappeared and so had l !!! 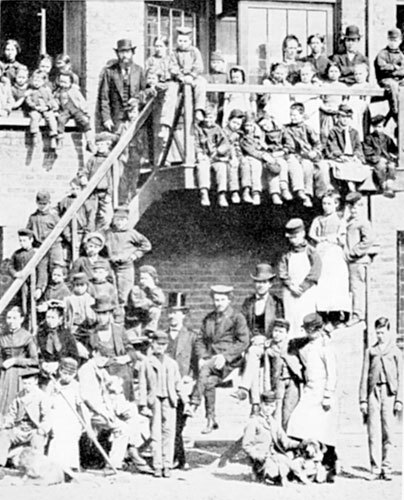 l had nothing………..
National Children’s Home Charity, now renamed ‘Action for Children‘ was started nearly 150 years ago. 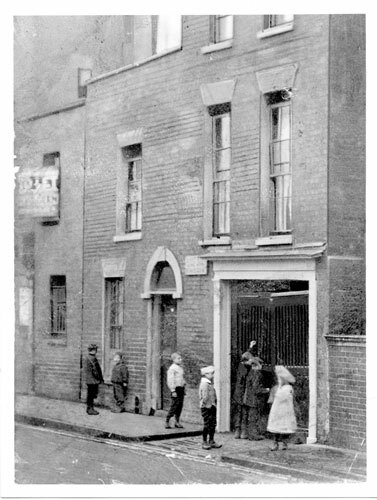 These images show its early days, the boys and girls it took off the streets, and the building it inhabited. Malmesbury House long time before it was the National Childrens Home. 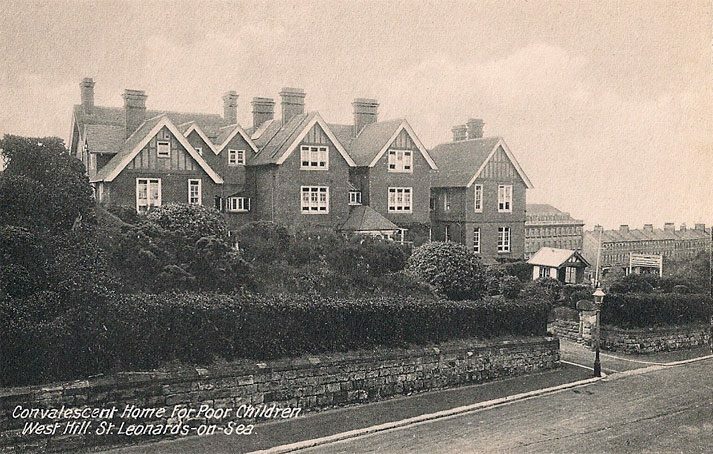 — at St Leonards on Sea. MALMESBURY HOUSE, NCH. ST LEONARDS On Sea, SUSSEX. 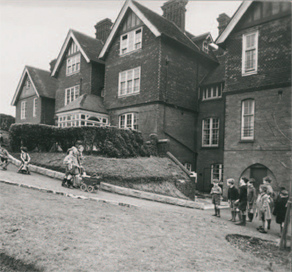 In 1953, the National Children’s Home (NCH) opened its new Malmesbury House premises at 125 West Hill Road, St Leonards on Sea, Sussex. The property, a former convalescent home, received its initial intake from the NCH’s home at Malmesbury in Wiltshire and had been renamed in commemoration of this. Once in the home l was measured, poked and tested every 6 months……..
Gillian Boulton d.of b. 18.12.50. C.A.10:4. M.A.11:4 I.Q. 110.
of 11 years 4 months and an I.Q. of 110. On the Raven Matrices she obtained a score of 28 and so falls into grade II, indicating that she is of above average intellectual ability. However my relationship with my father was somewhat difficult and unresolved. But, I never stopped believing in him, I always thought he would come and take me back home, but he never did…...I believe this is my nature, as l am fiercely loyal. Maybe I’m too optimist and blind-sighted in the face of devotion?…..Unconditional love. In my NCH notes from the time they say that l’m always very excited of the prospect of any visits by my father, but as soon as he arrives they note that l become very subdued and quiet. Those that know me well, know that I come straight out with stuff, well, when it came to my dad, I didn’t, I should have said “pick me!” l should have said we can get through this together, but I was struck dumb in his presence, unable to say what I wanted to say – Why? Well, for fear if I spoke up I would lose him too, which ironically I did anyway, so (unnaturally) I kept quiet……A rare thing for me! The moral of this story is speak up, however hard it is – don’t miss the opportunity to make yourself heard, if no one listens, shout louder, never give up. Don’t hand yourself over to fate without a fight !! I can remember having this picture taken, it has remained in my memory because it captures a when l was in trouble, l had to go before Mr Craig, head of Malmesbury house and this is the story……..Every year at Christmas time, one of the children in the home get picked out to have a special gift and (for whatever reason?) that year l was chosen. So this particular Christmas l received the pram in the photo, but l wasn’t allowed to push it down the hill for the picture, because the day before l had been caught riding the pram down the same hill go-cart Style! l am the little girl at the bottom of the hill with the boys ha ha. l was a bit miffed, but fair cop gov’ner! Mr Arthur Craig, Governor of Malmesbury House. Sometimes, because l was a bit of a ‘live wire’, l had to go before the head of Malmesbury house and this was him….Mr Craig, actually he wasn’t too scary, he was very nice, a kind man, he was held in the greatest respect by everyone, staff and children alike. Mr Craig knew all of our background stories and took interest in us as individuals. He saw that l excelled in the arts and so placed me with a creative family, when l was fostered he came with Sister Marjorie to make sure l was happy in my new home…..l think that was very thoughtful. l really don’t know how l would have survived without Sister Marjorie, seriously life was made bearable by her, l owe her so much it is impossible for me to properly explain. 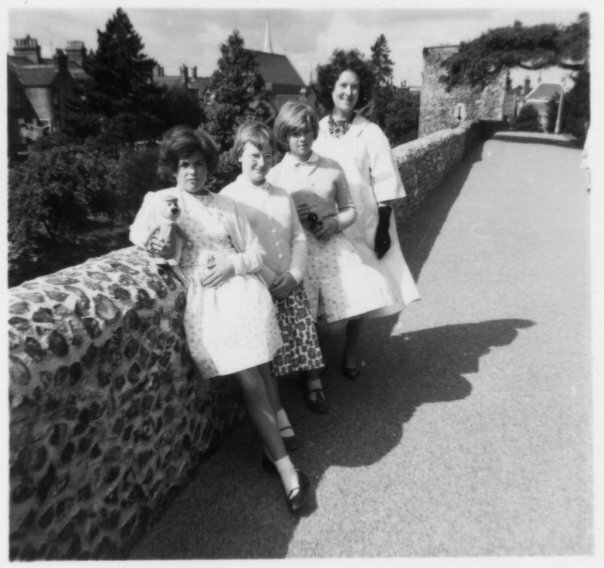 Within the home there were six family units, each one looked after by a sister, but this sister was more like a mother to me, l really loved her….Sister Marjorie was an angel….Well you can see by just looking at the photograph of her the humour and warmth she radiates. l was quite sensitive, but very spirited (possibly naughty? well just a little ha ha!) but she understood, never did she lose her temper or shout, she always listened to your point of view, because l always had an excuse for every naughty deed! Sister Marjorie was clever with her hands too, she was a very accomplished dressmaker and had the patience to show me how to make things. She knew about all the little preferences the girls had and from one batch of fabric she would conjure up several different designs for all us girls to be different, she was so gifted. The one downside to being fostered was that l had to leave my Sister Marjorie, it was like pulling teeth!….l have never forgotten her. Me (Gilly) with Yogi Bear, Linda, my foster parents niece, Joyce (also from the home) & Auntie Hazel, soon to be my foster mum………..When l first went to live with her it was strange that the home should give me another girl (Joyce) from the home to settle me in with, and a bit cruel to send her back once l had found friends of my own. l would think this would be upsetting to Joyce and would explain the slight resentment that l felt from her………We were both visited and went on holiday with Auntie Hazel, when we we both lived at the home. l went to live with her, her husband Roy and her best friend Jeanne at the end of July 1962. This truly turned my life around………l always did fall in the sh** and come up smelling of Roses he he! Unfortunately Joyce was not so lucky. 2 Responses to IN CARE at St Leonards NCH (1959 -1962). Hi Gill, My son was showing my husband and I how to use google earth. He looked up Malmesbury House and we of course discovered its demise. One thing led to another and I discovered your blog which I read with great interest. I remember you and I was touched that you remembered me. I was Susan McQuillan now Stulich. My memory of Malmesbury House is pretty good as I was there for nearly 10years. I now live in New Zealand but would love you to contact me if you would like to. Best wishes, Sue. Great to hear from you Sue…..50 years!!! Hey what took you so long ha ha ! Have just emailed you…..We have a lot of catching up to do! Love from your sister in care, Gill.